The Arduino folks took advantage of Maker Faire New York to announce their new line of products. There’s several interesting new additions to their product line. They’ve got a WiFi shield in the works that utilizes a module from H&D Wireless in conjunction with an AVR32 processor to take the workload off of the ATmega chip on the Arduino board. It even has room for you to run your own code on the shield’s processor. Notable (but of less interest to us) is the 1.0 release of the IDE and the development of a new low-cost board. That hardware is intended to make USB device development easier for those already familiar with the Arduino platform. But the big news that caught our eye is the announcement of an ARM Cortex-M3 Arduino called the Due (we already wish that had been named something different just for search term contrast to the Duemilanova). The hardware hasn’t been finalized yet, although you can see a prototype in the picture above. They want community input on the final touches, so get in there and give them a hand! Couldn’t have come at a better time. though i do wonder about the existing armduino’s like the maple etc. Here’s hoping that this will become part of the RadioShack lineup! Just got communication this morning that we will have a large selection of Arduinos within the next few weeks. If anyone is in Knoxville, stop by and see me in Turkey Creek! Wow, that’s impressive! I have to nearly beat ’em over the head at my local radio shack to have them special order capacitors. I would like nothing better than see them turn it around, add heathkit, and sparkfun…but I’m only dreaming. That is awesome news! I’m in Knoxville and was hoping that the local stores would be getting some Arduino love! @Beat707 – All these boards come with whatever SRAM and Flash and EEPROM that the host microchip was built with. By keeping memory out of the board design, it helps keeps cost low. If you want more memory, there are a lot of instructables for building a memory board of any type. I have not built one but they all look very simple to build. (But it seems to me very few sketches ever need even 64K… the big memory using sketches I have seen all could have benefited from storing strings in the underutilized Flash and EEPROM. yeah its waaaaay better to keep a mistake around rather than bite the bullet and change it. sorry charliex, I can’t resist: You mean like the qwerty keyboard? What’s really interesting is that it’s the Arduino IDE that’s really becoming the standard, not any piece or architecture of hardware. Just push the frigging headers out or in for the 01 spacing and release a “adapter shield”. Ain’t rocket science! @Charliex – No one cares about pin spacing. The people who complain about pin spacing are the same people who complain that Arduino is “overkill”. There’s no point in addressing any of this because if it was, the same people would boast how they don’t “need” shields. If the shield issue were settled, they would boast that they never prototype using prebuilt Arduinos, and don’t fathom why “lazy artists” cut corners and buy their boards. If pin spacing were important to even a sizable minority, we would see more ‘duinos with “correct” pin spacing. This is such a dead, burnt horse. Actually, keeping compatibility is a Microsoft approach. Windows is full of old stuff. Apple does not really care about old versions. I wish they’d fix the pin spacing if only so I could use a regular piece of perf board to make a custom shield. this pin spacing does prevent placing the shield backwards, a nice touch for total beginners. Try using Google.it instead, the Italian version and it should work fine. Uno=one, Due=two, it all seems pretty sensible to me. And don’t forget about chipKit MAX32 which is out already and has more SRAM. It looks like it has quite a few more pinouts to hook up to which would be a welcome addition. A little hard to tell from the picture, but does it also have more PWM pins? That would also be quite helpful for a few of my projects. If you want more PWM, make more PWM. Don’t be depended om hardware, create it in software. If programmed right, it might not even slow your program down. @Spot: they solder the tiny chips on for you. ave you counted the pins? The cost of a DIP would be insanely cumbersome and the sales would be awful. I imagine DIP breakout boards exist, or will soon. I prefer DIP for most things also, but more and more DIP is being left behind. Economics.. I like the DIP packages for various one-off projects as well. 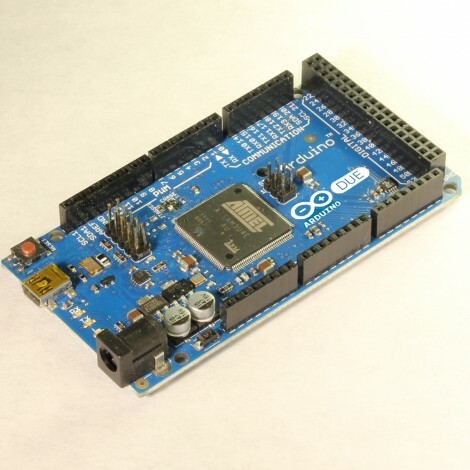 Another possibility is to buy a cheap Arduino (clone) for use as a programmer and then buy a bunch of blank DIP AVR parts. You’ll have to build a little perf board that has a socket to plug the blank DIP parts into. You can use the Arduino to load the Arduino bootloader into the blank parts. Then you can use a FTDI cable to program your DIP Arduinos (even when plugged into your final circuit with a little forethought). Makes it possible to easily upgrade the firmware in your device. Or you can setup your own AVR development environment and use your Arduino just to load the final program directly. I bet the bga or qfn package is cheaper. Is there a manufacturing limitation or are they scared to pitch out a bga? I just wish people wouldn’t use this to blink LED eyes on a Jack O’ Lantern. if this means easy arm development-ide with a c library, wonderful! there are arm boards under $30 out there already. no need to go for a clone then..
I’d love to see an arduino board that had an extra socket for 8 pin DIP Atmels as well….That would be great. It’ll have to offer a lot more to take on the Raspberry Pi. I have just upgraded mine with a £1 usb Bluetooth adapter, a £4 Wifi adapter and it’s pulling ADC readings using a Arduino.